I love Kermit! (Shhhh don't tell Miss Piggy)......How about you? KERMIT THE FROG (Kermit the Frog) returns to the big screen in 2011 in Disney’s “The Muppets.” With 56 years in show business, he boasts countless credits in television, film, stage and online, including the recent hit viral videos featuring the Muppets’ take on Queen’s “Bohemian Rhapsody” (2009) and “Ode to Joy” (2008)—both Webby winners (an award very dear to Kermit’s heart and feet). He has been honored with his own star on the Hollywood Walk of Fame (2002), and his song “Rainbow Connection” was nominated for an Academy Award® and a Golden Globe® in 1979. Kermit has appeared many times in the Macy’s Thanksgiving Day Parade. He received the Key to the City from Kermit, Texas, in 2005, and holds an honorary Doctorate of Amphibious Letters from the Southampton College at Long Island University. He was the first amphibian to address the prestigious Oxford Union at Oxford University. 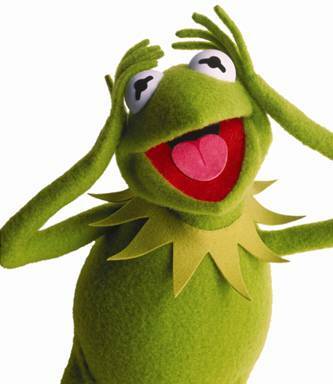 Kermit’s film credits include “The Muppet Movie” (1979), “The Great Muppet Caper” (1981), “The Muppets Take Manhattan” (1984), “The Muppet Christmas Carol” (1992), “Muppet Treasure Island” (1996) and “Muppets from Space” (1999). He’s also had starring roles in the TV films “Muppets Wizard of Oz” (2005) and “A Muppet Christmas: Letters to Santa.” In addition to hosting and starring in the international hit phenomenon “The Muppet Show,” which ran from 1976-1981, Kermit’s small-screen credits include “Muppet Babies” and “Muppets Tonight.” He has appeared on a host of variety shows, including “The Tonight Show with Jay Leno,” “Late Night with Jimmy Fallon,” “The Late Late Show with Craig Ferguson,” “Today” and “Late Night with Conan O’Brian.” Kermit has also been a guest on “Extreme Makeover: Home Edition” and “Saturday Night Live,” among many others. Kermit’s memoirs—“Look Before You Leap: A Frog’s Eye View of Life’s Greatest Lessons”—were published in 2006. Kermit resides in a swamp, where he maintains a bachelor pad. It’s funny, upbeat and full of laughs for everyone… frogs, pigs, bears… even people. For new fans, it’s a chance to see the Muppets in action on the big screen. And for old fans, it’s a chance to get together with old friends… and get a little crazy together. Well, it’s the story of this incredible Muppet fan named Walter who comes to Hollywood to meet us… and ends up having to get all the Muppets back together to put on a show and save Muppet Studios. I guess it’s the first Muppet movie that’s really from the point of view of a fan. Jason Segel, who is a really big Muppet fan in real life, co-wrote the movie. He wanted to show what it would be like if the world’s biggest Muppet fan—along with his brother Gary (played by Jason) and friend Mary (played by Amy Adams)—came to Hollywood to meet us. What is your role in Disney’s “The Muppets”? I play me, Kermit the Frog. I’ve played other parts, like Bob Crachit in “A Muppet Christmas Carol” and Captain Smollett in “Muppet Treasure Island,” but I think “me” is my favorite part. Playing a frog named Kermit might be type casting, but there aren’t a lot of great parts for amphibians, so I was happy to get the part. In the movie—and in life, really—I’m a humble frog in Hollywood who wants to get back together with his friends and keep entertaining people. How does your life differ from the characters you play in the films? Well, on the big screen. I’m 16 feet tall. But in real life, it’s closer to 18 inches. So, I’d have to say the biggest difference is more height—and better lighting. Seriously, though, my life on screen and off screen is about the same. In real life and on film, I’m surrounded by chaos, craziness, and romantic pigs—just like any other Hollywood star. Why did you want to take part in this film? I understand they considered other actors—George Clooney, Tom Hanks. But in the end, when it comes to playing short, green and amphibious, I’m still Hollywood’s go-to guy. According to director James Bobin, when I read for the role of “me,” I nailed it. I like the scene where everything goes crazy and no one knows what to do. It’s total mad chaos…..Hmm, come to think of it, that describes most of the movie. I can’t pick JUST one scene—all the other scenes would get jealous. But I really do like the big finale. Lots of singing, dancing, laughing… and, I don’t want to spoil it, but it’s happy, too. Jason is not only a great comedian, but as a co-writer of the movie, he’s great to work with. If you forget your lines, he can make up new ones. Jason’s a swell guy. He really loved the Muppets before we worked together…and he still loves us after. That’s a true fan. And he has such a fantastic sense of humor. He can find funny everywhere… even in Fozzie’s act. Chris plays the villain, Tex Richman, yet he’s really the nicest guy you’ll ever meet. That’s an incredible feat: being a good guy and playing a bad guy. When it comes to acting, it’s not that easy being mean. Amy is incredible. She’s so beautiful and talented and funny. I’d love to make every movie with her…. but Miss Piggy won’t let me. She’s also a great actress: she can sing and dance, and she has three Academy Award® nominations. I’m hoping she gets an Oscar® for Disney’s “The Muppets.” If not, I’m willing to paint myself gold and stand on her mantle. I have to say: working with Miss Piggy is always a pleasure. I have to say that ‘cause she makes me say it. This was a different kind of movie for us. Normally, Piggy and I are together right from the start. But in Disney’s “The Muppets,” Miss Piggy is over in Paris and we have to go get her. That was challenging for me. France is tough for frogs… with legs. What’s the deal with you and Miss Piggy? Are you still together? Miss Piggy and I have a professional relationship. I think we’re professionals; she thinks we’re in a relationship. Actually, Miss Piggy and I are good friends, but just friends. We like each other a great deal, but we are not romantically involved—despite her best efforts. James has a quirky sense of humor. Just watch his work on “Flight of the Conchords” and you can see this isn’t someone who sees the world like everyone else. Not being normal helps when you work with the Muppets. He’s a consummate professional—and we’re not, so we really needed him. What is your advice for up-and-coming frogs/actors? To make a rainbow connection with Kermit the Frog, check out http://disney.go.com/muppets/portfolio/kermit/videos.html. Looking forward to seeing it with my kids! Same here! Thanks for stopping in. I'll pop over and give you a visit and some comment love, too!